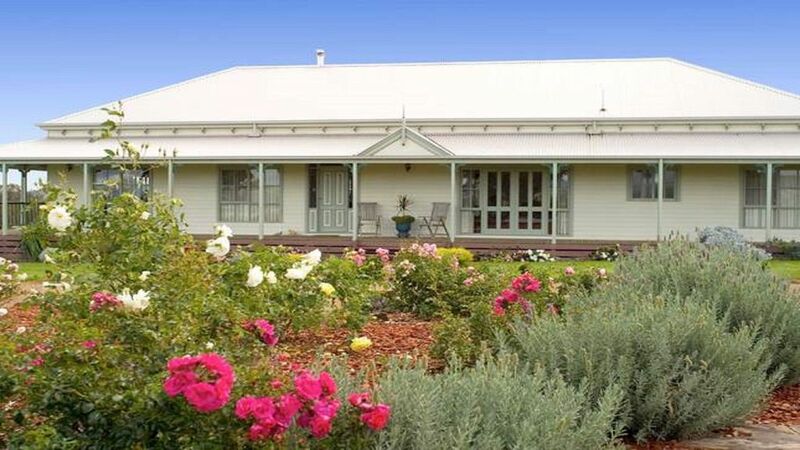 Wongabeena Homestead offers a beautifully appointed self contained apartment with spectacular views. If you wish to experience complete relaxation in a world far away from the hectic way of life, this is the spot to be. This spacious apartment with its own entrance is surrounded by million dollar views. On entering you will immediately notice the high standard of furnishing and finishes. Your spacious living room offers a very comfortable 2.5 seater sofa and 2 separate armchairs, a 4 seater dining set, and a new kitchen with microwave and cooking facilites. The adjacent spacious bathroom has a modern feel, with a separate shower, bath, and double basin. Your bedroom with queen size bed, luxury bedding and mirrored wardrobes makes the feeling of indulgence complete. Wongabeena homestead is ideally suited for couples, but the 2.5 seater in the lounge does convert into a sturdy double sofabed, which offers accommodation for an extra couple or children. A playground including swings, monkey bar and cubby house is on site so children will have fun. BBQ is available upon request. Wongabeena Homestead does not allow pets. A 3 night minimum stay is applicable to long weekends and public holidays. Wongabeena Homestead offers the ideal location for complete relaxation, but is also centrally located as a base for the many activities that can be undertaken. We have listed some of them below. If you wish to know more, feel free to call us. There are many activities in the Mansfield/Merrijig area such as snow skiing (in winter), horse riding, Lake Eildon boating and fishing, bushwalking, hot air ballooning, golf, plus Mt Buller's many winter and summer activities. Weekend events range from Mansfield"s bush markets, which are held four times a year, to the Tolmie Sports day held every year in February and the Merrijig Rodeo which is held on Labour Day weekend, ensuring that there is plenty of activities to entertain you all year round. With glorious views across the Alpine National Park, snow activities in winter and bushwalking or mountain bike riding in summer, Mt Buller is a great place to visit all year round. There are a number of trail riding businesses in the area, offering yard led walks for the young ones, through to weekend trips and longer rides. Have a look at their sites. It is important to book early to avoid disappointment. The alpine area has hundreds of 4WD tracks, most of which open over the summer season. Talk to the Mansfield Information Centre on for up to date information on which tracks are open. Take a scenic tour to explore the High Country. Visit the famous Craig?s Hut which has recently been rebuilt following its destruction during the 2007 bushfires. If being on the ground is too slow ? take the opportunity to explore the Alpine Region from the air! There are many great walking tracks in the area. Check with the Mansfield Information Centre on or more information on bushwalking tracks. Drop in to the Snowy River Rug Company to get the low down on the best fishing spots in the area. They have all the gear to back you up on your next adventure. Martina and Kees have been providing short stay rentals since 2008. They are proud owners of this small acres hobby farm and are keen to offer relaxing stays and an introduction to young and old to our friendly mini horses, Jasper and Toby, our small flock of sheep and Sanzac the alpaca, our cuddly chooks and. last but not least, Shadow our very child friendly Kelpie X dog. Delivering our guests an uplifting and long lasting experience for both young and old is our ultimate goal. The spacious bathroom includes bath, separate shower, his and hers basins, toilet and heating. Cutlery, crockery, utensils and pots/pans are provided for four persons. Access to large backyard plus 12 acre paddocks. Includes outdoor table and chairs. Thank you for staying with us and submitting your kind review, much appreciated. We were impressed you left the accommodation in such a clean and neat state. Please come again. We trust you had a safe journey home with not too bad weather. We had a great stay, very friendly on arrival, beautiful accommodation, everything we needed plus a massive bathroom, perfect for after a long day at the snow. Really quick and easy to get to Buller in the mornings. We enjoyed the brief time here. The accommodation was of a very high standard and the area quiet with lovely views and the forest next door was great for a walk. It was only a short drive to Mansfield and other places of interest in the area. Thankyou to our hosts who were very hospitable. We had a very enjoyable stay at Wongabeena. Clean, warm and comfortable. Would definitely return! Really enjoyed our stay, stayed as a couple. Had pretty high expectations based on the description on Stayz which were all met or exceeded. We enjoyed our stay very much. It was a very nice and cosy one bed room unit and it is bigger then its shown in the picture. Its about 50 mins drive to Mt Buller. We will definitely come back next year!! And thanks Martina and Kees for their swift responses.